You can order Absinthe through different suppliers. When it comes to an internet purchase trust is important. ALANDIA is the leading Absinthe store worldwide. We can look back on a history of more than 16 years, as we established our online store already in 2001. Since then we are proudly serving the Absinthe Community worldwide. To purchase Absinthe online there is simply no better place. We ship your Absinthe via trackable Airmail or Courier Express shipping service. It takes 8-10 days (Airmail USA) or 2-3 days (Courier Express USA), 10 days (World) or 3-5 days for European destinations till your ordered products arrive at your door. The delivery is always guaranteed, meaning if anything happens with your box, we will refund or reship. This is the trusted 100% ALANDIA Delivery Guarantee. Ordering real Absinthe can not be easier, safer and more convenient. If you directly want to order a bottle of Absinthe or some accessories just click on the link or on one of the products below. Is it legal and safe to order Absinthe online? Yes, Absinthe is legal and ordering Absinthe online is safe. As ALANDIA already was established in the year 2001, we have a lot of experiences in regard of logistics. All boxes are insured against breakage or loss and they are trackable online. We also ship in discrete packaging. And of course there is the trusted ALANDIA 100% Delivery Guarantee. You will get your order or we will refund you your money. All risks are covered, you don't have to worry about anything (visit our specific Absinthe for sale site to get more information about ordering the Green Fairy online). In our store you can order Absinthe bottles, Absinthe glasses, Absinthe spoons, Absinthe fountains, sugar, posters and everything else that belongs to the world of Absinthe. Order a bottle of the Green Fairy and step into the World of Absinthe. We will be more than happy to serve as well you! To drink your first Absinthe you need to buy a glass and a spoon. Only then you can drink Absinthe the authentic way. Therefore we recommend that you purchase these accessories as well with your first order. We accept all major credit cards like VISA and Mastercard and as well Paypal. We ship your Absinthe with a delivery guarantee. Which means you will get your Absinthe safe and sound or we will refund you your money, fullstop. 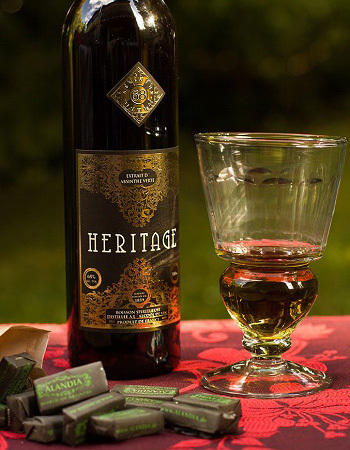 We think that building up a trustworthy and reliable partnership with our customers is the best way to make your Absinthe order a pleasant experience. Order Absinthe at ALANDIA and you will not get dissapointed. Absintheurs around the world use our service and share the magic of the Green Fairy with us. As Absinthe got legalized everywhere in the world (in the USA in 2007), you don't have to worry about any problems with customs. Nevertheless you have to be of legal drinking age to place your order. Who is a famous Absintheur? Toulouse Lautrec, van Gogh or Manet. They were famous Absintheurs! Of course they didn't order the Green Fairy through the internet, they commonly drank it in one of the bistros of Paris/France like for example the Moulin Rouge. Toulouse Lautrec posessed as well his very own Absinthe spoon. The artist also had a very special additional accessory: In his walking stick he had a reservoir for two shots of Absinthe. Well, there are so many interesting stories about Absinthe! You will find more information about the Absinthe history, the Absinthe ritual in our store. You should also visit our Absinthe Blog and Absinthe Facebook page. Enjoy the Green Fairy, enjoy Absinthe, enjoy ALANDIA! Where can I order Absinthe online? You can easily order your bottle of original Absinthe at oour online store. It doesn't matter if you are looking for Absinthe spoons, Absinthe glasses, Absinthe fountains, in our store you will find everything. Also make sure to check the Absinthe reviews that are available at every product page. Then you can see what other customers think about our products. Below you can see a video of the classic French Absinthe ritual, the way how you should drink your glass of Absinthe. Have fun!